The audit is complex process of independent examination of data, statements, operations, financial performances of an enterprise for a stated purpose. The auditing process consists of defined quantity of audit steps. Planning is fundamental stage of auditing process. The carefully thought-out audit planning process ensures the success of the business project. The flowcharts are one of the popular tools for auditors. Analyzing the chart auditor defines the problem areas, and then offers the ways and methods to improve process effectiveness. ConceptDraw DIAGRAM extended with Audit Flowcharts Solution from the Finance and Accounting Area allows to facilitate your auditing process and audit planning process, and will help you design your audit flowcharts quick and easy. Audit Flowcharts Solution for ConceptDraw DIAGRAM Solution Park provides easy-to-use design auditing process tools, offers the Audit Flowcharts library with large quantity of predesigned audit flowchart symbols, and also variety of samples and templates to make your auditing process and audit planning process quick, simple and effective. 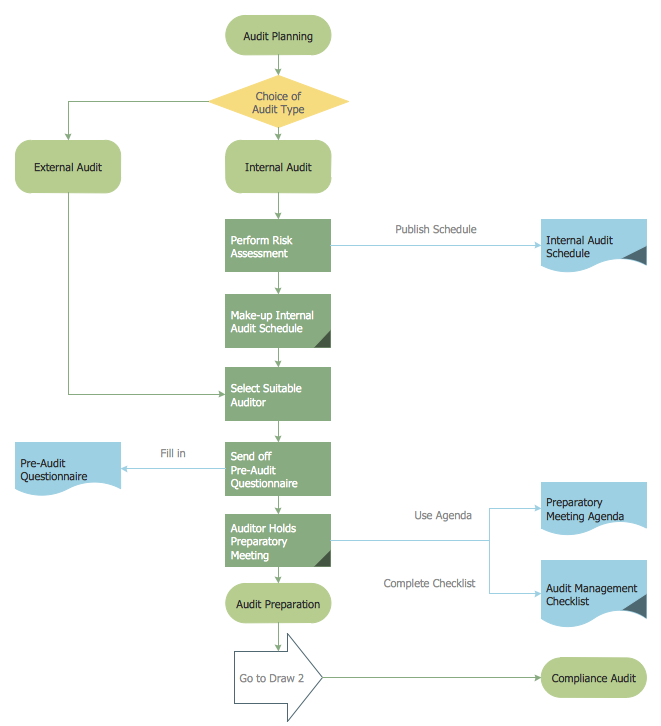 This audit flowchart was created in ConceptDraw DIAGRAM using the Audit Flowcharts library from the Audit Flowcharts Solution and shows the stages of pre-audit preparation and audit planning process. An experienced user spent 10 minutes creating this sample. 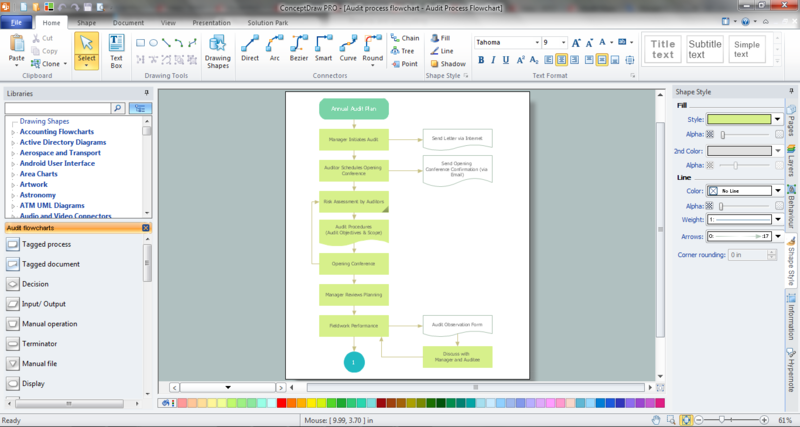 Use the ConceptDraw DIAGRAM with Audit Flowcharts Solution to create your own professional looking Auditing Process Flowcharts quick and easy. Audit Steps - The auditing process is an independent examination of data, statements, operations, records, financial or otherwise performances of an enterprise for any stated purpose. It is a complex process that includes 10 audit steps: Notification, Planning, Opening Meeting, Fieldwork, Communication, Draft Audit, Management Response, Final Meeting, Report Distribution, Feedback. Audit procedures are the specific tests and methods that auditor executes when gathering the evidence which are necessary for making an opinion on the financial statements of the firm. There are three types of audit procedures: data selection, reliability validation, relevance confirmation. Thanks to the extensive drawing tools which provides the Audit Flowcharts solution from the Finance and Accounting area of ConceptDraw Solution Park, you can easy and effectively develop and realize various audit procedures.